What is a Cenote and how were they formed? What is a Cenote and how were the formed? Mexico's Yucatan peninsula is low and relatively flat with no surface rivers or streams. However, below the ground run the two longest underground water systems in the world (Sac Actun 353 km and Ox Bel Ha 270 km) which have directed the distribution of human settlement on the peninsula for the last 10,000 years...the world of the cenotes and underground rivers. A "cenote" (pronounced say-NO-tay) is a natural sinkhole created where a cave ceiling has collapsed, a window to this spectacular world. Cenotes were the only source of water in the jungle for the Mayan civilization and are considered sacred by the Mayan people. The Mayan considered cenotes to be an entrance to their "underworld" or "Xibalba" where their gods live and their spirits reside after death. The word cenote is derived from the Mayan word "D'zonot" and refers to any subterranean chamber that contains permanent water. 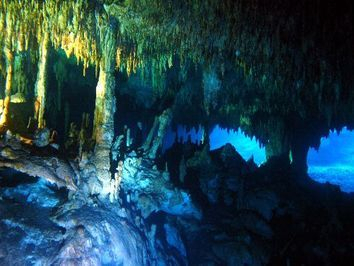 While some cenotes are vertical, water-filled shafts, others are caves that contain pools and underwater passageways in their interior. A combination of geologic events and climatic change has led to the development of these unique ecosystems. Millions of years ago, the Yucatan peninsula was a giant reef set under several feet of ocean water. During the last ice age, the ocean level dropped (water levels were approximately 300 feet lower than their present day levels), exposing the reef to the surface. The coral died, and jungle grew over the mile thick limestone platform created by the coral reef. Fossils found far inland are proof of this and are commonly seen during a cenote dive. Massive cave systems were formed by gradual dissolving of the highly porous coral limestone. These caves are called "solution" caves because they were formed by the slightly acidic rainfall dissolving the alkaline limestone. Inside the caves the geological formations such as stalactites, which hang like icicles from the cave's ceiling, and stalagmites, which extend upwards from the cavern floor, which often join to create columns, are a spectacular sight to see. These stalactites and stalagmites number in the millions and range in size from that of a pencil to the size of a big tree. Many of the caverns eventually collapsed and when the Ice Age came to a close 18,000 years ago, the climate of the planet warmed up, the glaciers receded, and the caves flooded as sea levels rose. Scientists have varying views on how fast water levels rose, but most agree that the water reached its current level around 1,000 years ago. Carbon dating of artifacts found in some area caves shows them to have been visited by humans over 9,000 years ago. Among the interesting archaeological finds in recent years are ancient fossilized remains of camels, giant jaguars, mammoths, sloths, and horses. To date, four human skeletons have been found. Tests on charcoal found beside one female skeleton would place it at least 10,000 years ago, which makes it one of the oldest human skeleton found in the Americas. Most of these have been found by cave divers exploring underwater cave systems and some sites are now protected by INAH, the Mexican government's archaeological and historical protection organization.